Patterns/Process Fabric for the glove was a charcoal gray glissenette. The rest was Casa satin. Believe it or not, I used the same pattern I based Pellegri on, but kept the lines from the hip straighter. Niho helped me adjust for the left side slit. On the left part of the inside lining, one of the pattern pieces was reversed, so the lining doesn't match up perfectly with the outer bodice. There was also a lot of trial and error with the glove sleeve. I fear that if I'm not to exact measurements, I could risk ripping it. 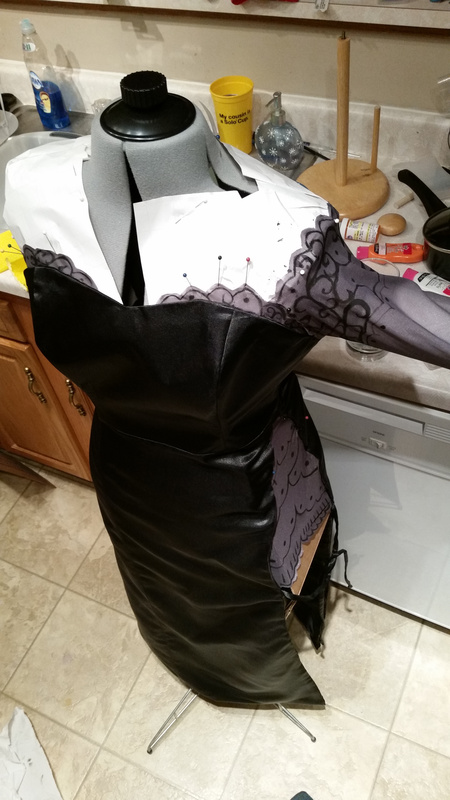 It was also extremely difficult for me to figure out how to turn out the lining. I wish I had figured it out before having to seamrip a few times. I'm extremely pleased with the bust shape. 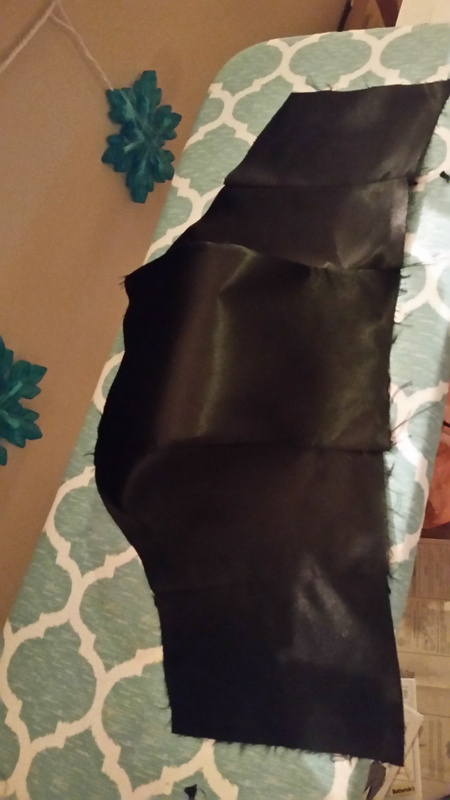 I used sew-on-top boning (courtesy of Niho) and it created the effect I wanted. I'm also happy with the way the painted glissenette looks. The shoes I found after I'd already cosplayed this, while somewhat uncomfortable, are also perfect for the outfit. Unfortunately, I don't have photographs that feature those shoes yet. I'd like to remake the hair barrettes and the comb. I want more exact earrings. I would like to wear separate clip-in ponytails for the hair behind the barette. If there were back references, I'd like to make that more accurately, but it is what it is, now. 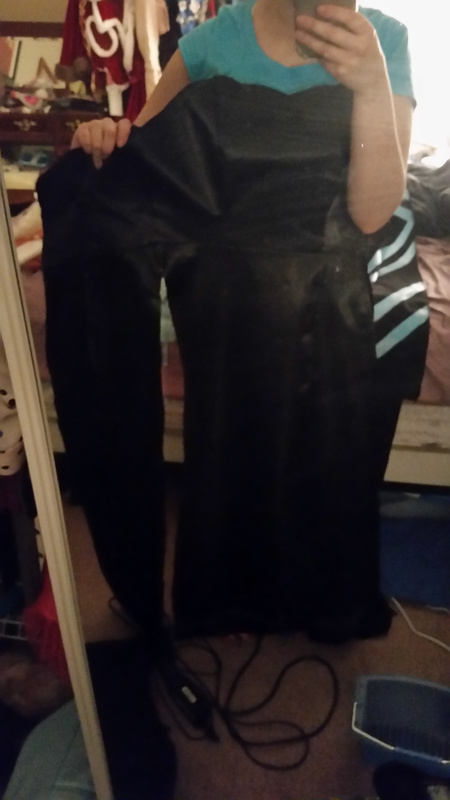 I've been waiting to fit into it better so that I can get photos in it, because the photos I do have are so few. I'd also like to wear it as a regular cosplay during the day rather than a formal ball cosplay—I want to avoid as much wear and tear as I can. Since you already know why I love Velvet, let me point out a couple details. If you hadn't noticed, Velvet's hair barrettes are made from fragments of the hair comb from the game. (SPOILERS) I love that they kept the continuity. The comb broke in the final battle with Innominat. I like to think that she collected the pieces of the comb, then repurposed them for this dress. The sentiment in-game was that Innominat could no longer manipulate her and her memories of Laphi. By wearing these reminders, she's owning her memories and finding strength in them. In the reference images, Velvet also holds what appears to be champagne. Given that the kind of furisode she wore (for the New Year) represents a coming-of-age, I'm hoping that this indicates she's allowed to age in the Link universe (and connected Tales collab universes like Rays, etc.). Velvet so deserves a future where she gets to live her life to the fullest and grow old. This outfit represents that for me—not to mention, an anniversary of escaping something terrible and rising above it has obvious parallels in my life. This will always be one of my favorite cosplays. I was wearing this dress when I won the Fanime Black and White Ball's Social Dancer Award in 2017—what an honor! I aspire to keep dancing with as many new faces as I can so that the joy of dancing spreads to whole new populations. I'm also tickled that this costume log falls on the anniversary of my being on Patreon!